Lately my son has been fascinated with science experiments. He’s asked me to make several items for his dress-up bin, including a lab coat like Dr. Doofenshmirtz. I hate making buttonholes and I’m not a big fan of collars either. Luckily, I had a brainstorm to repurpose a men’s dress shirt instead. The result was an adorable lab coat in about an hour and I didn’t have to sew any buttonholes. Score! Lay a pattern on top of the men’s shirt. I used a police officer shirt from our dress-up bin. A robe or jacket would also work well. 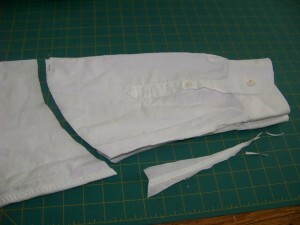 Fold the arms of the pattern in and then cut up the sides of the dress shirt, including arm holes. You’ll also want to cut across the bottom of the shirt. To be sure the sleeve and body of the coat match up, I used the body as a guide. 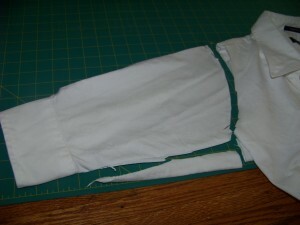 Just lay the body over the sleeve and cut along the edge. 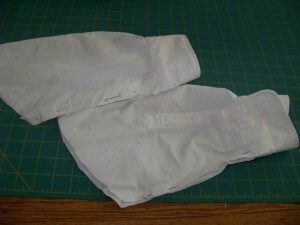 I also cut a little off the bottom of the sleeve to make it skinnier, but left the cuff intact. To cut the 2nd sleeve, lay the first sleeve face down on top of the 2nd and cut along the edge. 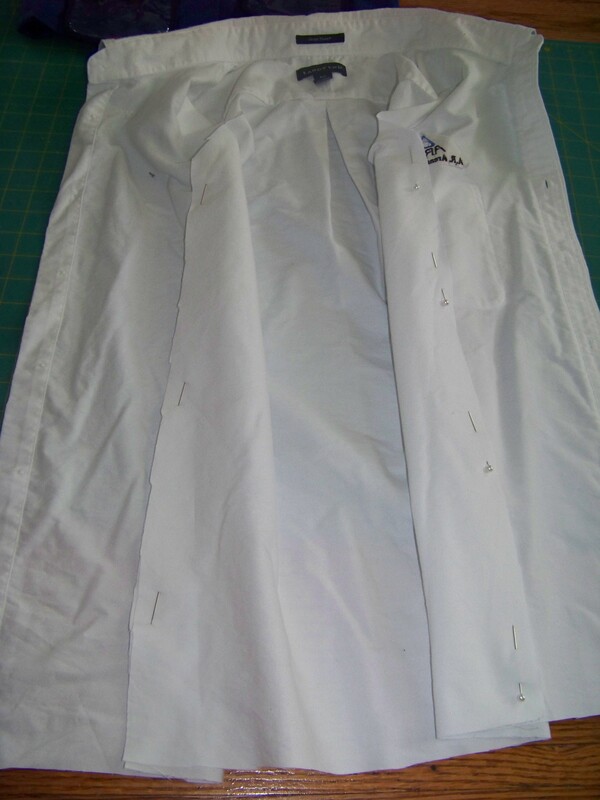 Now pin the sides of the coat, right sides together. Be sure to leave the arm hole open for the sleeve. Sew together. 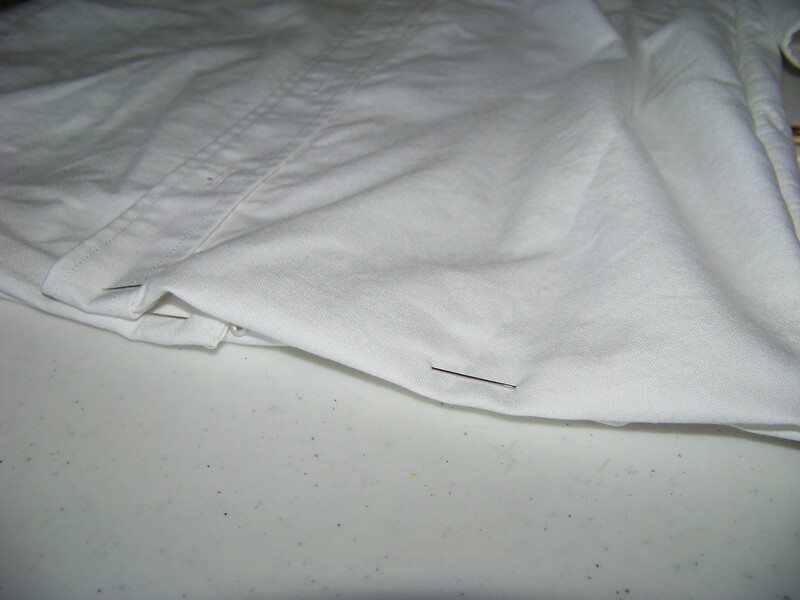 Turn the sleeves inside out and pin the seam, right sides together. 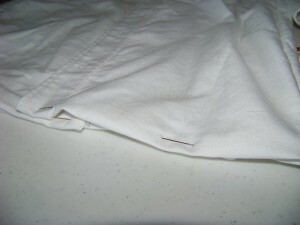 Sew from the cuff to the edge. This is the hardest step. Turn the sleeve right side out. Turn the coat inside out and pin the sleeve to the armhole. 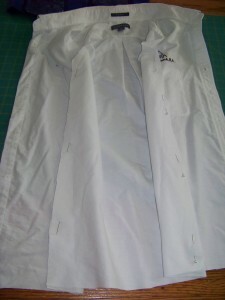 After pinning, turn the coat back right side out to be sure it’s pinned correctly. 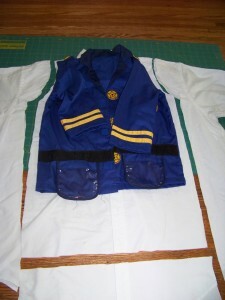 Pin the sleeves so that the buttons by the cuff are in the back. Sew around the armhole. Repeat with the other sleeve. Finally, hem the bottom of the coat. I turned it twice so the raw edge was hidden. You can stop here and be proud of the adorable lab coat to add to your child’s dress-up collection. I used fabric markers to write my son’s name and draw a beaker on the right side of the coat, opposite the logo. You could also sew velcro in place of the buttons. This entry was posted in Sewing, What We're Doing and tagged dress-up, gift, pretend play, science, Upcycling. Bookmark the permalink. Thanks for the great and easy tute! 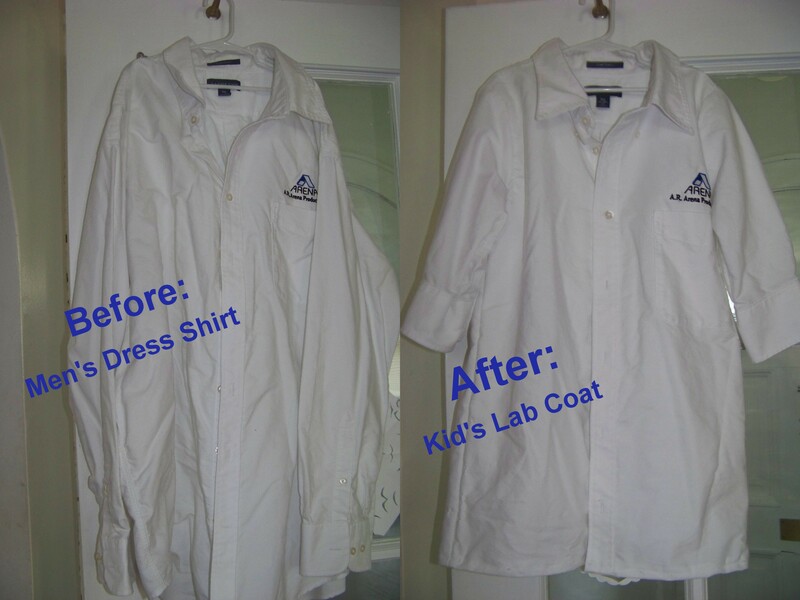 My daughter came home from school on Friday and told me she needed a lab coat for Tuesday….yikes, to the internet I went and found this great idea! I whipped one up in about an hour and it turned out great! She loved it!! Thank you! Thank you! Thank you! I just followed your tutorial to make a last minute “Mad Scientist” costume for my 2 year old son. I could never have done it without this great tutorial! This was wonderful! Easy to follow and easy to do. Within 30 minutes I had a Vet’s lab coat for career day. Thanks for sharing your tutorial! So glad you all enjoyed the tutorial. I just finished similar firefighter and police officer dress-up coats as Christmas gifts. Hoping to get those tutorials up soon! Thank you for the tutorial! The Elementary class at the Montessori school where I teach has been learning to sew and wanted to make their own lab coats…we’re doing this next week!! hi, thank you for the tutorial! I am in the early stages of learning to sew and made this for my twins to wear to a science party on the weekend…great helpful pictures…I have shared your link with other parents whose children are attending the same party…thank you so much! You are a life saver. MY DD wants to be a doctor for a her preschool career day. I am going into my husband closet right after this post and get started. Thanks. I am a novice sewer at best, and I can’t believe how easy this was. It took me less than an hour – thanks for sharing! Saved me a ton of time and money! My son wants to be a “mad scientist” for Halloween this year, and this was perfect for a scientist lab coat. This tutorial was wonderful! I put the sleeves in before sewing up the sides and it was even faster. Done in 30 min and it looks fab! Thanks for sharing. This was a great idea! My daughter just bought herself a chemistry set and asked for a lab coat. 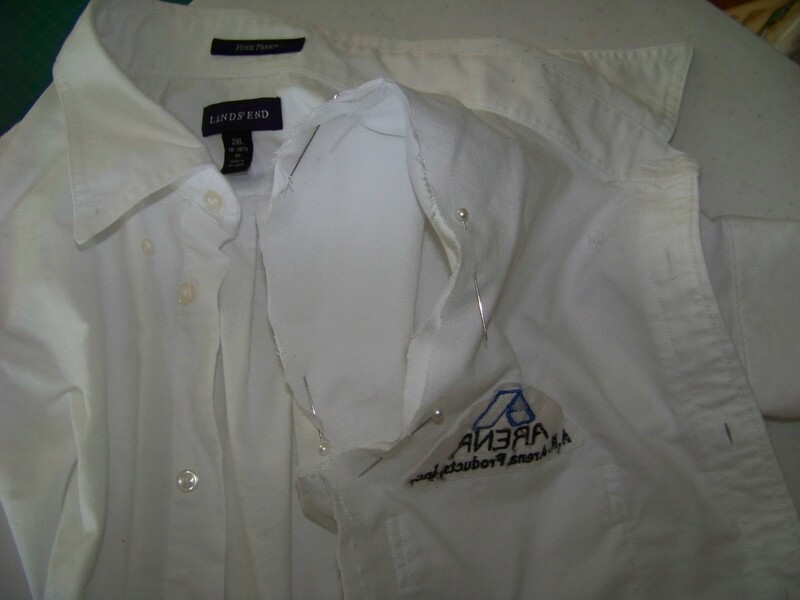 Her dad had some shirt with fraying cuffs he couldn’t wear anymore, and voila! For no money she had a new lab coat. Brilliant! Her dad’s shirts had a breast pocket, so we took it off and moved it to bottom right. We also did the sleeves a bit differently, cutting off the cuffs and then using the two together to create a belt in the back. Brilliant lab coat pattern. It was the first bit of sewing I had done in quite a few years, but easy to follow and I didn’t see the sense in spending £13 on a lab coat online. My son was doing a review of Demon Dentist by David Walliams at school (brilliant book) and he wanted to dress up as a dentist hence the lab coat. He is 8, so I bought a massive cheap men’s shirt from the charity shop and shortened the arms as per pattern and hey presto! He loved his lab coat and talk went down extreme well. Got the sewing bug back again now. Thank you so much! Great idea, followed your pattern and made the lab coat yesterday. I had some batman fabric left over from another project and made two patch pockets and some details on the collar. It turned out very well, Thank You.